For a more extensive listing of our favorite offerings, see our itemized menu! Traditional classic of fresh clams simmered in a creamy broth with crispy bacon, scallions, fresh herbs and New Red Potatoes. 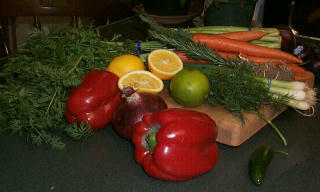 Fresh medley of garden vegetables are simmered in a tomato broth with fresh herbs and roasted garlic. Black beans are slowly cooked with carrot, celery and red onions, seasoned with spicy peppers, garlic and cilantro in a chicken stock till thick and creamy. Best garnished with sour cream. Gulf shrimp are pan-blackened then simmered in a creamy broth of fresh corn, red potatoes and scallions. Cubes of tender beef are simmered with potatoes, onion, carrots and celery seasoned with fresh herbs, in a rich red wine demi glaze, served with baking powder biscuits. Fresh leg of lamb is cubed and simmered with garden vegetables Rosemary and roasted Garlic, in a rich lamb demi glaze, served with fresh crusty French bread. Fresh Cod is simmered in a tomato based broth flavored with sherry, new red potatoes, onions, celery and of course garlic and fresh herbs. A typical North Indian dish, Chunks of lamb are seasoned with traditions spices, yogurt, tomato and onions very slowly simmered, best served with sticky rice and Naan. Combination of lean lamb, garlic, ginger, turmeric, spinach and onions slowly simmered. Traditional Indian dish made of simmered lentils, tomatoes, onions, cauliflower and roasted spices. Best Served with Basmati Rice side. Choice bottom round roast is braised with fresh herbs and then slowly simmered with carrots, celery, onions, potatoes, and tomatoes. Traditional Holiday ham is slowly simmer all day in apple cider till ready to fall apart then finished in the oven glazed with orange marmalade. Many different styles of this family favorite.... Traditional ground beef, Healthy ground turkey, Honey Mustard, or Your Own Grandmas Favorite recipe. Morsels of chicken are quickly saut�ed with onions, celery and carrots then simmered with fresh herbs in a rich chicken sauce, tpped with pastry crust and baked to a golden brown. Fresh whole chicken is cut into pieces, dredged in seasoned flour and braised with Tomatoes, Black Olives, garlic, fresh basil and oregano. Now you can have it anytime of the year.... Vermont Tom Turkey is slow roasted and served with traditional stuffing, Mashed Potatoes, Pan Gravy and of course Cranberry Sauce.... Ask about our Non Traditional styles for a change of pace. Fresh Eggplant is thinly sliced, lightly breaded and saut�ed, topped with a homemade Marinara sauce and Mozzarella Cheese, baked to perfection and served with your choice of pasta. Fresh sweet potato, bell peppers, onions, corn and black beans are simmered in mushroom broth with cilantro, lime juice and garlic, folded in a flour tortilla with refried beans and shredded cheese, baked and served with sour cream and your favorite salsa. Medley of wild mushrooms, sun dried tomatoes and broccoli floweretes are quickly saut�ed with Pesto, and toasted pine nuts, tossed with a flavored Penne Pasta. Traditional Classic of seafood simmered in a homemade Marinara sauce. Served with your choice of pasta. Multiple layers of vegetables, cheese and fresh pasta noodles are topped with homemade Marinara sauce then baked to perfection and served with Doreen's Famous Garlic Bread. Large pasta shells are filled with shrimp, mushrooms, spinach and herb seasoned ricotta cheese, topped with Mozzarella cheese, baked with a homemade Marinara sauce. Gulf shrimp are stir-fried with garden vegetables, seasoned with an oriental glaze, garlic, herbs and ginger, then tossed with Soba Noodles. Gulf Shrimp are quickly saut�ed with red and yellow onions, diced tomatoes and garlic, seasoned with fresh basil, white wine and lemon. Excellent served with either pasta or rice. Gulf Shrimp are quickly saut�ed with a homemade Marinara sauce and served with your choice of pasta. Gulf shrimp is quickly saut�ed in a homemade garlic butter, white wine and lemon. Best served with rice pilaf. 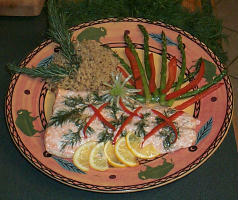 Fresh farm raised salmon is seasoned with fresh herb splashed with white wine and lemon and baked on a maple plank. Served with a spiced apple butter. Fresh farm raised salmon is coated in fresh chopped herbs, then pan roasted with white wine and lemon. Fresh farm raised salmon is wrapped with fresh basil leaves and cob smoked bacon, roasted to crispy perfection and served with a roasted red pepper herb butter. Fresh steak is grilled with a caper, tomato and olive butter. Fresh steak is rubbed with Cajun spices then pan blackened served with a Creole sauce of peppers and onions simmered in a spicy tomato broth. Tender porkloin is seasoned with Indonesian spices, braised with garlic and onions in a peanut sauce. Best served with sticky rice. A choice pork loin is lightly seasoned then stuffed with spinach, onion, and cheese. Slow roasted and served with a rich pan gravy. Pork tenderloin is coated with cracked peppercorns, spiced mustard, and cracker crumbs, slow roasted and served sliced on a wild mushroom sauce. Tenderloin of pork is seasoned with rosemary and cracked black pepper and grilled, served glazed with juice of fresh tangerine, and lime. Breast of chicken is stuffed with an herb cheese and broccoli, lightly breaded, and deep fried. Served sliced on a creamy Sauce Supreme. 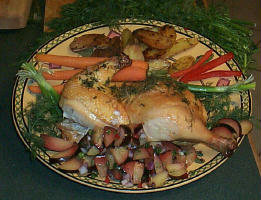 Whole chicken is marinated with fresh plums , garlic, ginger, soy sauce, and sesame oil, then slow roasted over a covered fire, and served with a salsa of fresh purple and red plums, red onion, fresh herbs, and lime juice. A choice tenderloin of beef is seared to lock in its natural juices, then coated with cracked black pepper, Dijon mustard, and cracker crumbs. Then it is slow roasted to perfection and served with a wild mushroom and scallion demi-glaze. Flank steak is marinated in soy sauce, garlic, ginger, pineapple, teriyaki sauce, and sesame oil. Then grilled to your order and served with saut�ed sliced onions. We slow roast a semi-boneless duckling to a crispy perfection and serve it with a sauce of red and black currants. Semi-boneless duckling is slow roasted to a crispy perfection and served with a cranberry, orange, and cinnamon glaze. Semi-boneless duckling is slow roasted to a crispy perfection and served with a classic citrus glaze and caramelized orange rinds. Fresh duckling is slow roasted to a crispy perfection and served with a fresh fig in a cinnamon scented port wine demi glaze, garnished with saut�ed wild mushrooms. Fresh Cornish Game Hen is seasoned with fresh herbs and slow roasted and served with a wild rice stuffing and cranberry orange glaze.